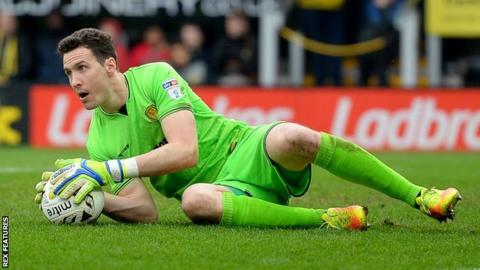 Hearts have signed former Burton Albion goalkeeper Jon McLaughlin on a one-year deal after a successful trial. The Edinburgh-born 29-year-old was released this summer despite being first choice as the Brewers avoided relegation from the Championship. Keepers Jack Hamilton and Viktor Noring are also in Hearts' squad. "I'm really pleased and obviously really looking forward to signing for a massive club like this," McLaughlin told HeartsTV. "It's my home town so it's a fantastic feeling and it's been great to be training with the lads for a few days, and I'm now just looking forward to getting on with the serious work. "You always want to be at clubs where you're competitive and you're looking to achieve things." Hearts interim head coach Jon Daly said of McLaughlin earlier this week: "The coaching staff have been very impressed by his training levels and his abilities. "The level he has been playing in the Championship is very competitive. It's very similar to Scotland, with cross balls and contact." McLaughlin, who began his career with Harrogate Railway Athletic in the Northern Counties East League, spent six years with Bradford City before joining Burton. He started 43 of 46 league matches in the Brewers' maiden season in the Championship, only missing their final three because of an arm injury. However, manager Nigel Clough decided not to offer a new contract and said he preferred to start the new season with 36-year-old Stephen Bywater, the Englishman who had been second choice most of the last campaign. Clough told his club website he wanted "to move into a different direction with a different kind of goalkeeper". Meanwhile, Daly has reaffirmed his desire to become Hearts' new permanent head coach. The former striker has been in interim charge since Ian Cathro was sacked days before the start of the Premiership campaign. Daly says a win over Motherwell on Saturday would help his cause but stressed that the decision should not be taken on the basis of only one game. "It puts us in a position where we have done a good job." he said of himself and fellow coaches Liam Fox, Austin MacPhee and Paul Gallacher. Daly says he understands that some Hearts fans may have problems in accepting another "rookie" manager but pointed out that Cathro's predecessor, Robbie Neilson, was a success. "The previous manager was a young manager, his first managerial job and it was difficult for him," he conceded. "I have been in the game at a professional level 20 years. Yes, 10% of that is in coaching the rest is playing the game. "I have a decent understanding of what's expected on the football pitch and how to win games."